Obituary for Harriet J. 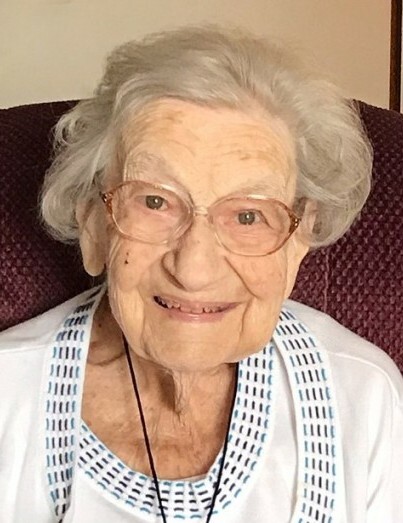 (Clapper) Boore | Timothy A. Berkebile Funeral Home Inc.
Harriet Jean Clapper Boore, 96, of Bedford, entered Heaven on March 23, 2019, in Bedford. Harriet was born on January 21, 1923 in Huntingdon, a daughter of the late James Walter and Clare (Anderson) Clapper. On July 14, 1945 in Bedford, she married her husband of 72 years, Raymond T. Boore, who preceded her to Heaven on February 11, 2018. She is survived by her daughter, Sheredith and husband, James Heitzenrater, of Richmond, TX, and her son, Brent and wife, Jan (Bierly) Boore, of Aiken, SC., five grandchildren and nine great-grandchildren. She was preceded in death by her sisters: Clare Pencil and Kathleen Faust, both of Bedford. Mrs. Boore was a graduate of Bedford High School, Class of 1941, where she was editor of the school yearbook. She graduated from the Western Pennsylvania Hospital School of Nursing in 1944, and enjoyed a rich career as a R.N. She later attended the Parkersburg branch of West Virginia University, and McNeese State University in Lake Charles, LA. She was active in the local and state nursing organization, as well as the A.N.A. She received a 25 year service pin from the American Red Cross, having served as an instructor, instructor trainer, and a board member. Mrs. Boore was a life-long member of the United Methodist Church, where she served on various committees. Harriet and Ray enjoyed a rich retirement life touring 48 states of this country while visiting family and friends. They lived in Mission, TX, where Harriet wrote numerous skits for the entertainment of friends in their retirement community. Funeral services will be held on Saturday, March 30, 2019 at 11:00 a.m., at the Bedford United Methodist Church, with Lay Minister and friend Jim Miller officiating. Friends will be received on Saturday, from 10:00 a.m., until the hour of the service at the church. Arrangements by the Timothy A. Berkebile Funeral Home, in Bedford. Memorial contributions may be made in Harriet’s name to the Bedford High School Committee on Excellence, 330 E. John St., Bedford, PA 15522.